A good number of workers of the Punjab unit of the Congress and the Youth wing of the Shiromani Akali Dal (SAD) from the state today came close to a clash on the issue of Chief Minister Amarinder Singh and former Chief Minister Prakash Singh Badal. Farmers here are in a state of shock. After a year of rumours and speculations, stark reality stares them in the face. They have no option but to part with their agriculture land. Former Haryana Minister, Mr. Sampat Singh, today termed as insufficient the minimum support price (MSP) of wheat announced by the Union government. The government today announced the MSP of wheat as Rs.750 per quintal. The Haryana Chief Minister, Mr Bhupinder Singh Hooda, today announced the setting up of the Haryana Rural Development Authority on the pattern of the Haryana Urban Development Authority (HUDA). The authority would carve out sectors in the state in villages having a population of more than 10,000. The Haryana Cabinet, which met here today, approved a proposal of the Excise and Taxation Department to exempt all goods from the levy of VAT (except goods mentioned in Schedule D) sold to Delhi Metro Rail Corporation Limited (DMRCL) for the completion of the Gurgaon Metro corridor (Gurgaon section), subject to the furnishing of a certificate from an authorised officer of the DMRCL. The Haryana Lokayukta, Justice N.K. Sud, who is a former Judge of the Punjab and Haryana High Court, has moved the High Court, seeking directions to the Union Home Secretary, the High Court and others for re-fixing his pension after adding the period for which he practised as a lawyer. Taking a cue from the Railways, the Haryana Transport Department has extended free travel concession in Haryana Roadways buses to one attendant accompanying a completely handicapped person. This was disclosed by the Haryana Transport Minister, Mr Randeep Singh Surjewala, after presiding over the district grievances committee meeting held at the district secretariat, here today. Directing the Electricity department to provide power connection to a tubewell in Navan village, the Haryana Transport Minister, Mr Randeep Singh Surjewala, asked the officials to carry out the orders within a week. Former Chief Minister Bhajan Lal’s son and Congress MP from Bhiwani Kuldeep Bishnoi has sought an apology from Chief Minister Bhupinder Singh Hooda for allegedly misinforming people regarding certain facts pertaining to his father’s tenure as Chief Minister. The dream of candidates to become the Excise and Taxation Inspector in the Haryana Government went up in smoke as the candidates received the admit cards one day after the examinations were conducted. The Haryana Cabinet, which met here today under the chairmanship of the Chief Minister, Mr Bhupinder Singh Hooda, approved the proposal of the Revenue Department to increase registration fee to augment revenue. The Haryana Cabinet, which met here today under the chairmanship of Chief Minister, Bhupinder Singh Hooda, gave its approval to Town and Country Planning Department’s proposal for the increase in rates of licence fees and conversion charges by 5 per cent in hyper and high potential zones. In the medium and low potential towns no increase in licence fees or conversion charges will take place. Dakshin Haryana Bijli Vitran Nigam (DHBVN) has decided that load on any transformer will not exceed 70 per cent so that better quality of power can be supplied to the consumers. Mr Raghunath Goel (90), a former MLA of Kaithal, died here today and his funeral procession was attended by a large number of people. The Haryana Government has decided to increase the remuneration of lambardars from 3 per cent to 10 per cent with effect from January 1, 2006, in the matter of collection of water charges from cultivators. Another polio case in district? Once again two inmates of Bal Kunj at Chhachhrouli have fled from the orphanage. One of the absconder has done it for the third time. During the past two years at least seven such cases have been reported. In a bizarre incident a horse tied to a cart went berserk on the Chandigarh-Roorkee national highway here and trampled two persons to death and injured another here this afternoon. The injured is fighting for life in a private hospital. However, a strong posse of police personnel posted near Trident Hotel, allegedly owned by Mr Badal’s family, to thwart any ugly incident, averted a possible clash. Although the two camps were divided in favour and against Capt Amarinder Singh and Mr Badal, the larger issue was corruption. Each camp had identified its “villan of the piece” labelling him as the “most” corrupt and “scum” of the earth. The Congress brigade was from Kapurthala district of Punjab headed by the District Congress Committee, Mr Sukhpal Singh Khera, and the SAD side headed by the vice-president of the state unit of the Youth wing of the party, Mr Rana Ranbir Singh. However, the Congress contingent from the neighbouring state, numbering about 300, showed more vocal power in comparison to the SAD group, which numbered about 100. While the Congress group came here in an attacking posture, the SAD group was ostensibly here to counter it. The Congress camp also had a good number of sarpanches and councillors from Kapurthala. The Congress team appeared to be organised and well prepared with placards and other advertisement stuff labelling Mr Badal as the “King of Corruption”. The SAD group tried to belittle the Congress workers by raising slogans suggesting that Capt Amarinder Singh was the most ineffective Chief Minister of Punjab. Mr Khera, addressing his party workers, revealed a sense of injured ego on account of the alleged charges levelled by Mr Prakash Singh Badal and his party against Capt Amarinder Singh. He made it clear that the Congress workers had come to Trident Hotel to show to the public the “monument of corruption” that Mr Badal and his son Sukhbir Singh Badal had indulged in when they were in power. He alleged that about Rs 2,200 crore had been pumped in the hotel. Asserting that Mr Badal hailed from a family of agriculturists, he wondered from where Mr Badal and his son got this huge money to set up a hotel. He also said that the hotel was only tip of an iceberg of corrupt practices indulged in by Mr Badal’s family when they were in power. He further said that on the water issue, Capt Amarinder Singh was fighting the case of Punjab. The Akali Dal youth leaders countered the Congress charge, saying that Capt Amarinder Singh was the most ineffective Chief Minister who had no control on law and order in the state. With the process of acquiring of land by the Special Economic Zone (SEZ) developer, Reliance Industries Limited (RIL), getting underway, the farmers are surrendering their agriculture land with a heavy heart. Their apparent emotional attachment with fields make them weak in the knees while stamping a thumb impression on the sale documents despite getting a unreasonable price in the bargain. Reliance has opened its office in Jhajjar and Bahadurgarh, where its land acquisition officials are completing the formalities for the registration of sale deeds in the favour of RIL. The officials are also urging people to sell their land as soon as possible and are arguing that it will be in their benefit if they buy land elsewhere to make up for the land loss. RIL is offering a uniform price of Rs 22 lakh per acre to the farmers for setting up the SEZ proposed to come up in 22,000 acres in Jhajjar and Gurgaon districts. According to RIL sources, about 400 acres have been mutated in its favour while farmers owning about 1,000 acres have submitted their documents with the company for which formalities are in process. Out of 22,000 acres, 14,000 acres fall in the district covering 22 villages in Jhajjar and Badli blocks. Interaction with farmers in nearly a dozen villages during a visit by this correspondent revealed that barring a handful of people nobody wants to sell land. “I have ploughed these furrows throughout my life. Even a thought of parting with this fertile fields sent shivers down my spine”, says an elderly farmer in Devarkhana village, who owns 250 bighas of ancestral land. He still has hope that the project could be halted midway if some political twist takes place at the Centre or in Haryana. Satpal, a youth of Mundakhera village who works in Delhi, says his family has 12 acres of good agriculture land. Asked whether they are considering selling the land, he says firmly, “We do not intend to give away the land. Let us see what happens when the state government comes to us”. Praveen, a youth who himself is not engaged in farming activities, says he will not give his land to Reliance, but the state government has the power to take it over. He adds that if Opposition parties decide to take up the issue and mobilise people here in protest against the acquisition move, people will certainly extend their support. According to rough estimates emerging after interactions with people, a maximum of 20 per cent people are voluntarily accepting the Reliance offer. While a majority of people are preferring to wait till the government’s acquisition move starts, another category of people are selling the tracts in their urgency to purchase land in distant places before the escalation in land rates there. The people maintain that the small farmers with one to five acres holdings will be the real victims of the SEZ project as they will not be able to buy land at other place after losing ancestral land. However, a chunk of villages, including Badsa, Dariyapur, Lagarpur and Mundakhera, are completely aloof from the SEZ project. Mr Joginder, sarpanch of Badsa village, confirmed that nobody had approached Reliance from these villages. While admitting that jobs and development of areas would come with this project, he clearly stated, “People are not satisfied with the price being offered by RIL as their land touched the borders of Delhi and thus should be compensated accordingly”. Talking to mediapersons here today, Mr. Sampat Singh said the MSP announced by the government was too little and much below the actual market price of wheat. Mr Sampat Singh said the main idea behind announcing the MSP was to provide a support price to the farmers when the market failed to provide the same. It was due to this reason that the MSP was always kept higher than the market price. But now when the wheat was selling at a price of Rs.1100 to Rs.1200 per quintal in the open market, the government had played a bad joke with the farmers to announce an MSP of Rs.750 per quintal. He said that the MSP was only 7 per cent higher than the MSP of previous year as the government had announced Rs.650 as the MSP and Rs.50 as bonus last year. The government could not procure sufficient wheat from the farmers last year only because it had kept the MSP very low. To make up the deficit, the government had to import wheat from other countries. It waived 50 per cent import duty on the import of wheat but even then the wheat imported by it cost it more than Rs.1100 per quintal. He further alleged that the wheat imported from other countries was not only costlier, it was of inferior quality. It was revealed by a report on a television channel that the quality of wheat imported from Australia and sent to Rajasthan for storage was of such a bad quality that even the animals would not like to eat it. The former minister demanded that in case the government was really interested in the welfare of farmers and it wanted to procure sufficient wheat to fill its ware houses, it must announce an MSP, which is higher than the actual market price of Rs.1200 per quintal. The Deputy Chief Minister, Haryana, Mr Chander Mohan, today, welcomed the decision of the UPA to raise the MSP of wheat. Mr Chander Mohan, also the minister in charge of the Food and Supplies Department, said for the first time the MSP had been hiked by Rs 100. The Chief Minister made the announcement while addressing panchayati raj representatives of Jind district at his residence here. The Chief Minister said the state government had taken a number of steps to strengthen the panchayati raj institutions in the state. An honorarium of Rs 1,000 per month was being given to the sarpanch of every village. The power to keep cash in hand had also been increased from Rs 5,000 to Rs 10,000 for sarpanches. He added that persons having more than two children had been allowed to contest the election of panch and sarpanch by making an amendment to the existing law. Listing various measures on the rural infrastructure front, the Chief Minister said for the first time 1,000 villages in the state had been identified to ensure their all-round development. Funds amounting to Rs 40 crore had been earmarked for the construction of stadiums in the rural areas, he added. He said funds had been also released for the repair of village schools, veterinary hospitals and chaupals. While referring to developmental work undertaken in Jind district, he said a regional centre of Kurukshetra University had been set up in the district. Also, a separate college for women had been set up at Jind. Work on the bypass of Jind had already been started, he said. The Local Area Development Tax Act is not required for the project in any case as the structure being constructed by the DMRCL is taxable and hence not covered under local area development tax. The Cabinet also gave its approval to the funding of the extension of Delhi Metro to Gurgaon by state government agencies. Out of the total funding of Rs 167.25 crore, Rs 67.25 crore would be given by HUDA and the rest by the HSIIDC. The Cabinet authorised the Financial Commissioner, Town and Country Planning Department, to sign the agreement with the Delhi Metro Rail Corporation. The Cabinet also cleared a proposal of the Excise and Taxation Department for framing the rules for the post of superintendent of field offices. The proposed rules will be called the ‘Haryana Excise and Taxation Department Subordinate Offices (Group B) Services Rules, 2006. The new rules will replace the Haryana Excise and Taxation Department Subordinate Offices Ministerial (Group-C) Service Rules, 1981. The new rules for the post of superintendent of field offices have been framed in view of the conversion of the post from Class III to a Gazetted II post. The Cabinet also cleared an amendment to the Haryana Welfare of Scheduled Castes and Backward Classes Department (Group B) Service Rules, 1985. Justice Sud has also prayed for setting aside the amendment in the High Court Judges Salaries and Conditions of Service Rules, 1954, vide the Government of India notification of September 16, 2005, through which the benefit of 10 years practice as a lawyer to Judges of the High Courts for determining the qualifying service for pension and other benefits, has been denied. In his petition, he has stated that those recruited directly from the Bar are denied this benefit while Judges elevated from amongst the District and Sessions Judges belonging to state judicial services as well as Judges of the Supreme Court are extended this benefit. Justice Sud has maintained that the amendment is discriminatory against the High Court Judges elevated from the Bar. He has also prayed that the action of the authorities in fixing his pension at Rs 6399 per month be set aside and instead, the same be re-fixed by taking into consideration the 10 years period of his practice at the Bar before elevation to the bench. Today, the Division Bench comprising Acting Chief Justice S.S. Nijjar and Mr Justice S.S. Saron issued notices for November 6 to the respondents. Taking a cue from the Railways, the Haryana Transport Department has extended free travel concession in Haryana Roadways buses to one attendant accompanying a completely handicapped person. This was disclosed by the Haryana Transport Minister, Mr Randeep Singh Surjewala, after presiding over the district grievances committee meeting held at the district secretariat, here today. "This was brought up before the Chief Minister, Mr Bhupinder Singh Hooda, and me, by one such handicapped person who said that the benefit for free travel was of no use to him since the attendant had to pay for the ticket. We were convinced of the futility of the concession in the absence of the same for the attendant. 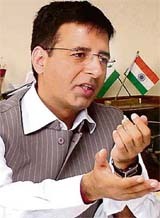 A decision has been taken and a notification for the same will be issued in about 10 days time," Mr Surjewala said. With 2006 being observed as the "Year of the Girl Child", Mr Surjewala said the Hooda government had decided to grant a further concession of 50 per cent to nearly 1.38 lakh students of schools and colleges. "They were already getting a 50 per cent concession. Now, as an incentive, we have further halved the fare being charged. Girl students will now have to pay five full fares to travel for one month. Though these concessions will burden the state exchequer, the Transport Department is not about only earning money but we stand committed to fulfilling our social responsibility," the minister stated. Travel concessions have also been granted to national youth awardees for a whole lifetime, free travel to deaf and dumb along with an attendant, Thalassaemia patients and their attendants and state awardees in Urdu, Sanskrit, Hindi and Punjabi. "We realised that not even 10 per cent of the awardees were availing themselves of the concession. The bottleneck came from queuing up for renewal of the pass year after year. Now they will be able to travel anywhere in the state on one pass for their entire lifetime according to revised rules," Mr Surjewala stated. The department has also mooted 75 per cent concessional facility in bus fare to participants of state-level meets and sports championships organised by the state- level associations, those conducted by the sports departments , participants of the All-India Rural Sports Meet (as and when it is held) and national-level sports contests organised in the state. He was presiding over the district grievances committee meeting at the district secretariat, Sector 1, here today. He also directed the officials of the Electricity Department to present a report of the same to the Additional Deputy Commissioner, Mr Parveen Kumar. The sarpanch of Navan village, Balbir Kaur, had represented to the Minister about the lack of a power connection to the tubewell constructed at Rs 4.80 lakh. The minister directed the police to register an FIR against Bhoola Ram of Rattewali village who had mortgaged village land in connivance with bank officials for Rs 80,000. Of the 19 complaints received at the meeting, 10 complaints were addressed on the spot. Later, chairing the meeting of the Local Area Development Board, Mr Surjewala said that Rs 54 lakh had been distributed among the four blocks. While 9.75 lakh had been sanctioned for Barwala, Rs 2.90 had been given for Morni, Rs 20.13 lakh for Pinjore and Rs 8 lakh for Raipur Rani. Also present at the meeting were Mr Brijendra Singh, Deputy Commissioner, Mr Balbir Singh, Superintendent of Police, Ms Vandana Disodia and City Magistrate among other officials of the district administration. Earlier, at the monthly meeting of the district officials, the Deputy Commissioner, Mr Brijendra Singh, urged the officials of the Health Department to discharge their duties with greater devotion at the pulse polio round slated for November 12. Stating that two polio cases had been reported from the district, he appealed to the authorities of the Health Department to work towards eradicating polio with renewed enthusiasm. He said that members of the gram panchayats, sarpanches and women should be roped in to ensure that every single child is administered polio drops. On the forthcoming National Road Congress slated for November 17, the Deputy Commissioner said that officials involved with the programme should particularly ensure cleanliness of Sector 5 and the city. He asked officials to gear up for the national badminton competition beginning from November 20. Addressing a press conference at Hisar today, Mr Bishnoi maintained that during a public rally on October 25 at Nissing, the Chief Minister had stated that no compensation or government jobs had been provided to the next of kin of two farmers killed in police firing during the tenure of Bhajan Lal as Chief Minister around 13 years ago. The Congress MP asserted the Bhajan Lal government had provided Rs 2 lakh as ex gratia and government jobs to the next of kin. “The Chief Minister should publicly apologise for issuing factually incorrect statement against Mr Bhajan Lal,” he demanded. Meanwhile, Chief Minister Bhupinder Singh Hooda has come under fire from different quarters after he made a “mistake” by announcing government jobs to the families of the two farmers. Opponents of Mr Hooda have launched an attack after it was revealed that the families of both farmers were not only given ex gratia but victims’ bothers were given government jobs in 1994. Though the state Public Relations Department had publicised the “compensation” given by Mr Hooda, it refused to confirm the status of the affected families. None of the district officials was ready to comment over the issue. When contacted, CM’s Media Adviser Sunder Pal said he had asked the departments concerned to give a detailed report. It may be recalled that during the Bhajan Lal regime in 1993, two farmers — Lakhpat and Mamchand — were killed in police action. Sources confirmed that Lakhmi and Sompal, brothers of Lakhpat and Mamchand, respectively, were given government jobs as well as ex gratia. The candidates were shocked to receive the admit cards by post today. The entrance test was conducted by the Haryana Staff Selection Commission yesterday. Mr Vivek Bhatnagar, roll number 21,390, said he had received the admit card today. “When I opened the letter, I found that it was for the post of Excise and Taxation Inspector and the examination was over yesterday. I do not know what to do. I had studied hard for this exam and my effort has gone a waste due to a delay in the delivery of the letter,” he said. Mr Bhatnagar said as per information, four other candidates also received their admit cards late today. The “Haryana Staff Selection Commission must look into this matter and they should consider holding another exam so that all candidates could be accommodated,” he said. A Postal Department official said the Postal Department had received the letters on October 17 at Panchkula and they were despatched to various districts in Haryana by October 20. He said that an inquiry will be conducted to find out the reason behind the non-delivery of these admit cards on time. The Cabinet decided that a registration fee of Rs 500 would be charged for property valued at Rs 50,001 to Rs1,00,000, Rs 1,000 would be charged for property valued at Rs 1,00,001 to Rs 5,00,000, Rs 5000 would be the rate for property valued at Rs 5,00,001 to Rs 10,00,000, Rs 10,000 would be charged for property worth Rs 10,00,001 to Rs 20,00,000 and Rs 12,500 for property valued at Rs 20,00,001 to Rs 25,00,000. For property valued at over beyond Rs 25,00,000, Rs 15,000 would be charged. Earlier, the maximum registration fee on any property used to be Rs 500. In another decision, the Cabinet granted exemption from the payment of entertainment duty for shows by magician O.P. Sharma. A total of 1,416 shows are to be put up by the magician at Yamunanagar, Ambala, Kurukshetra, Karnal, Panipat, Sonepat, Faridabad, Gurgaon, Rohtak, Bhiwani, Jind, Hisar and Kaithal between November, 2006, and October, 2008. The Cabinet also decided to raise the age of superannuation of senior executive pilots and junior pilots of the State Civil Aviation Department from 58 to 65 years subject to their medical fitness. The Union Ministry of Civil Aviation had earlier raised the maximum age limit for professional pilots due to the shortage of experienced pilots in the country. The Cabinet also gave expost facto approval for the re-employment of Dr Vijender Singh, Director, Forensic Science Laboratory, Haryana, on a contract basis for a period of six months. The Cabinet also decided to change the nomenclature of the Department of Urban Development to that of Department of Urban Local Bodies. The Cabinet also decided to provide state government guarantee of Rs 1 crore to the National Safai Karamcharis Finance Development Corporation (NSKFDC) on behalf of the Haryana Scheduled Castes Finance and Development Corporation (HSFDC). The NSKFDC would provide financial assistance in the form of term loan to the Haryana Scheduled Castes Finance and Development Corporation to the extent of 90 per cent of the project cost for specific schemes for financing safai karamcharis. The remaining 10 per cent of the unit cost would be borne by the HSFDC in the form of loan and beneficiary’s share. The Cabinet also approved the department’s proposal for creation of a fund for development of major infrastructure in Haryana. The fund will be administered by a high powered committee headed by the Chief Minister. A spokesman for the nigam, said the decision had been taken to ensure uninterrupted power supply to the consumers. He said in case of increase in the number of power connections, a new transformer of higher capacity would be installed immediately to meet the growing demand. For the better maintenance of the power transmission system and for the appropriate use of power in commercial works, a full capacity 11 kv feeder would be installed in each sub-division, he added. He stressed upon the need for issuing bills on the basis of the feeders so that the consumers being fed by the same feeder could be clubbed under the same bill group. This would help in keeping an up-to-date record of the consumption of power and revenue generated by the feeder concerned. The decision was taken at a meeting of the state Cabinet, which met here today under the chairmanship of the Chief Minister, Mr Bhupinder Singh Hooda. During a function organised by the Haryana Lambardars Association at Gohana, the Chief Minister had announced that 10 per cent pachotra on abiana would be given to nambardars from January 1, 2006. The financial burden on this count would be Rs 2.06 crore annually which would be borne by the Irrigation Department. The Cabinet also gave relaxation in the norms for the construction of village road bridges over canals and drains to benefit villagers and avoid an expensive land acquisition process for the construction of bridges. The norms have been relaxed to cover bridges on all consolidation paths connecting abadi to abadi and abadi to a public utility place. As per police sources, Bablu and Radhey Shyam Pandey fled some time yesterday afternoon. The police has been informed. Bablu had fled Bal Kunj on two earlier occasions also but each time he was traced and brought back. Pandey was brought here from Ambala. He was among the 14 street paddlers who were caught at Ambala railway station and lodged here. No official of the District Child Welfare Council, which runs Bal Kunj, was available for comment. Eyewitness said the horse went berserk after a truck driver from behind the cart applied pressure horn. The cart driver lost control on the horse and reportedly fell on the road. The horse along with the cart started running “madly” on the road towards Jagadhri from Kamani Chowk. The horse trampled two cyclists coming from the opposite side before putting its forefeet on a scooter rider. The horse stopped when one of the wheels of the cart got stuck in a roadside pit and the cart overturned. One of the cyclists, Shyam Lal, died.